As is inevitable with most major holidays, Thanksgiving Day’s historical and cultural roots (dating more than 350 years ago) have long been traded in for cross-cultural exposure and mass marketing in the United States. Though it may sound bad, it has its advantages. Nowadays, the enjoyment of good food — and even better company — on the fourth Thursday of every November does not belong solely to the descendents of the Pilgrims and the Indians. Asian American households will join the rest of the nation on Nov. 26 to celebrate that one day a year when it is acceptable, and even encouraged, to gorge beyond the normal boundaries of human consumption. 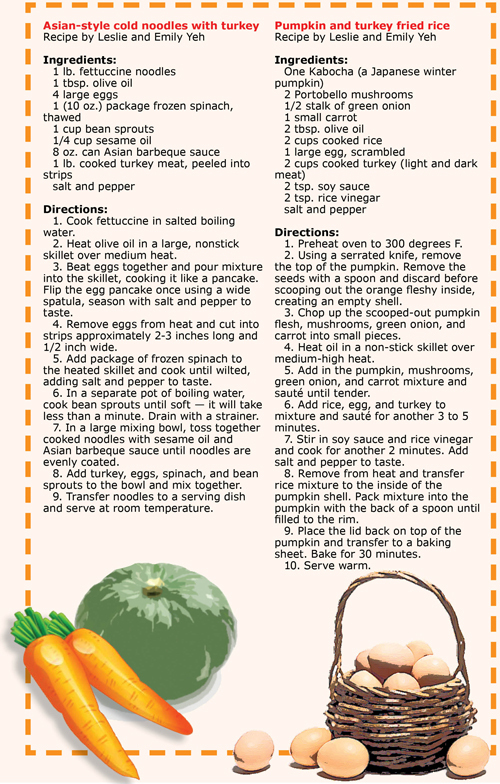 So what are some tips to infuse the traditional Thanksgiving feast with a dash of Chinese flavor? 1. Can Peking duck be the new turkey? Although turkey has traditionally stolen the spotlight at Thanksgiving dinner, another type of roasted meat is vying for center attention in Asian American households across the United States. Dating back to the imperial era in Beijing, the vastly popular Peking duck offers a tasty and quick alternative to the 4-hour long roast that has long served as the centerpiece of the feast. Peking duck is a savory meat with a crispy, delicately-fried skin brushed with a coat of honey. Although delectable alone, the meat is best served in a Chinese steamed bun sprinkled with spring onions and lathered with sweet hoisin sauce. No need for the conventional hung brick oven. Peking duck can just as easily be perfected in a standard home oven within 30 minutes, shaving away a considerable period of time spent in the kitchen. To the Chinese, hot pot presents the opportunity to gather around the table and partake in a communal dining experience. What better day is there to enjoy this nutritious and fulfilling meal than Thanksgiving? It’s a holiday designed for the sole purpose of sharing food. A type of Chinese fondue, hot pot consists of a simmering pot of broth at the center of the table in which an assortment of meats, vegetables, tofu, egg, noodles, and wontons are cooked. In addition to providing a fun and communal meal, hot pot is ideal for serving a large group with diverse preferences, as people are free to pick and choose their menu from the raw assortment. In addition, the warm and simple flavors of the hot stew can easily be complemented with a roast turkey or a pumpkin pie for dessert to maintain the spirit of a traditional Thanksgiving. Only two tools are needed to inject a Western-style Thanksgiving dish with a bit of Eastern finesse: a hot stove and a wok. The method of stir-frying, the quick tossing and stirring of cut-up ingredients in a wet seasoning sauce, is the most common method of Chinese cooking and a superior way to extract and meld together disparate flavors. Typical Thanksgiving ingredients such as string beans, meat, onions, and carrots can be swiftly stir-fried with Asian herbs and spices (ginger, garlic, cumin, five spice, or soy sauce) for an instant fusion. Try stir-frying strips of turkey with ginger and cranberries, or green beans with a pinch of soy sauce and garlic to create a few Asian-inspired dishes that might just supersede traditional green beans and carved turkey at the dinner table. Americans are not the only people with a day designated for celebrating the bountiful fall harvests. In China, the national harvest festival takes the form of the Mid-Autumn, or Moon Festival. On the 15th day of the eighth month (in accordance with the Lunar calendar), individual moon cakes are unwrapped by festival observers and delicately consumed with fragrant Chinese tea — directly underneath the bright autumn moon, if possible. These delectable pastries have a sweet, dense filling — often filled with a yolk to symbolize the moon — encrusted within a thin, crumbly layer of dough. Serving these delicacies as an after-meal treat is an excellent way to blend the harvest festival traditions of the East and the West. After testing the elasticity of your stomach the night before, the thought of turkey or mashed potatoes the next morning may not be so appealing. However, leftovers from the previous night’s feast are an excellent starting point to sizzling up a few Chinese-style dishes which may just whet your appetite again. So instead of packaging leftover turkey in zip-lock bags — most likely to remain in the freezer for the next several months — try adding the versatile meat to a mandarin salad (sliced and paired with fresh orange slices), fried rice (minced with carrots and green onions), or congee (mixed with eggs and chopped peanuts). You may be surprised at how the meat can take on a whole new aroma when combined with different elements. Leslie Yeh can be reached at info@nwasianweekly.com.